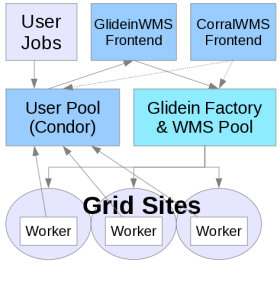 The glidein Factory node will be the HTCondor Central Manager for the WMS, i.e. it will run the HTCondor Collector and Negotiator daemons, but it will also act as a HTCondor Submit node for the glidein Factory, running HTCondor schedds used for Grid submission. On top of that, this node also hosts the Glidein Factory daemons. The Glidein Factory is also responsible for the base configuration of the glideins (although part of the configuration comes from the Glidein Frontend). Note: The WMS Pool collector and Factory must be installed on the same node. Note: This document refers to the tarball distribution of the Glidein Factory. If you want to install or installed via RPM please refer to the OSG RMP Guide. A major installation, serving tens of sites and several thousand glideins will require several CPUs (recommended 4-8: 1 for the HTCondor damons, 1-2 for the glidein Factory daemons and 2 or more for HTCondor-G schedds) and a reasonable amount of memory (at least 2GB, 4GB for a large installation to provide some disk caching). The disk needed is for binaries, config files, log files and Web monitoring data (For just a few sites, 10GB could be enough, larger installations will need 100+GB to maintain a reasonable history). Monitoring can be pretty I/O intensive when serving many sites, so get the fastest disk you can afford, or consider setting up a RAMDISK. It must must be on the public internet, with at least one port open to the world; all worker nodes will load data from this node trough HTTP. Note that worker nodes will also need outbound access in order to access this HTTP port. The installer requires several non-privileged users. These should be created prior to running the GlideinWMS installer. Factory The Factory will always be installed as a non-prvileged user, whether or not privilege separation is being used. One user per Fontend (See notes) If you are using privilege separation, you will need a user for each Frontend that will be communicating with the Factory. Otherwise, no new users need to be created for the Frontends. Note 1: In some places the installer will also ask for nicknames to go with the DNs. These nicknames are the HTCondor UID used in its configuration and mapfile. The name given doesn't matter, EXCEPT if you are using privilege separation. Then on the WMS Pool the nickname for each Glidein Frontend must be the UNIX username that you created for that Frontend. Note 2: The installer will ask if these are trusted HTCondor Daemons. Answer 'y'. When installing the Factory you will need to specify the directory location for various items. Due to new restrictions on the directory permissions, it is no longer recommended that you install GlideinWMS into the /home directory of the user. We recommend putting these and most of the other directories in /var. All the directories in /var have to be created as root so you will have to create the directories ahead of time. Note: The web data must be stored in a directory served by the HTTP Server. You will need the OSG Client (formerly VDT client). You need to install it yourself using either the RPM or the tarball provided by OSG (see here). If you installed OSG Client using the RPM, the binaries will be in the system path. If you installed it using the tarball, then answer 'y' when asked if you want OSG_VDT_BASE defined globally. Unless you want to force your users to find and hard code the location. By default, match authentication will be used. If you have a reason not to use it, be sure to set to False the USE_MATCH_AUTH attribute in both the Factory and Frontend configuration files. install_type tarball Indicates this is a HTCondor tarball installation. hostname wmscollectornode.domain.name hostname for WMS Pool. The WMS Pool and Factory must be colocated (on the same host). username condor (or whatever non-root user you decide on) UNIX user account that this services will run under. DO NOT use "root". For security purposes, this value should always be a non-root user. However, if privilege separation is used (see the privilege_separation option), the manage-glideins script itself will need to be run as root (see above), since the HTCondor switchboard requires some files to be owned by root and some files to be owned by the non-superuser username for privilege separation to work correctly. service_name condor-wms Used as the 'nickname' for the GSI DN in the condor_mapfile of other services. .
condor_location /path/to/condor-location Directory in which the condor software will be installed. IMPORTANT: The WMS Pool and Factory are always installed on the same node. The condor_location must not be a subdirectory of the Factory's install_location, logs_dir or client_log(proxy)_dir. They may share the same parent, however. If privilege_separation is specified, this must specify the unique UNIX user account you set up for that Frontend service. If privilege_separation is not specified, this must be the Factory username. condor_tarball /path/to/condor/tarballs/condor-version.x-linux-x86-rhelX-dynamic.tar.gz Location of the condor tarball. The installation script will perform the installation of condor using this tarball. It must be a zipped tarball with a *.tg.tz name. number_of_schedds 5 The desired number of schedds to be used. There must be at least 1 schedd. If you are using privilege separation, please control the content of the PrivSep configuration file (/etc/condor/privsep_config) and make sure that the callers and targets are colon separated lists including respectively all the users (and default groups). The Factory runs under and the ones representing the Frontend. This should match the security_classes section in the Factory configuration (glideinWMS.xml). 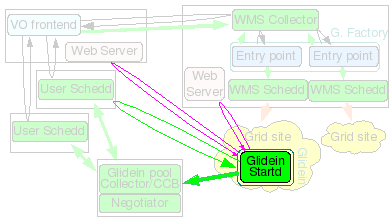 The Glidein Factory requires a proxy from the Frontend to use for submitting glideins. This proxy must (at any point in time) have a validity of at least, the longest expected job being run by the GlideinWMS and not less than 12 hours. How you keep this proxy valid (via MyProxy, kx509, voms-proxy-init from a local certificate, scp from other nodes, or other methods), is beyond the scope of this document. The Glidein Factory itself should be installed as a non privileged user. The installer will create the configuration file used to configure and run the Factory, although some manual tunning will probably be needed. The manage-glideins script should be run as the Factory user when installing the WMS Factory (see the username option below). At this time, for the Factory, only tarball installations are supported. Valid values: tarball. hostname wmscollector.domain.name hostname for Factory. The WMS Pool and Factory must be colocated. (non-root account) UNIX user account that this service will run under. DO NOT use "root". For security purposes, this value should always be a non-root user. Although the WMS Pool and Factory must be colocated, they can be run as independent users. service_name factory-wms Used as the 'nickname' for the GSI DN in the condor_mapfile of other services. . The install script will create this directory if it does not exist. * then the entire path (inclusive of this directory) must be root-writable-only (0755 and owned by root). * these directories cannot be sub-directories of the Factory's install_location or logs_dir. * then the directory can be independent, or nested as a subdirectory, of the Factory's install_location or logs_dir. If the above requirements are satisfied, the install script will create the necessary directories. If not, a permissions error will likely result. instance_name v2_5 Used in naming files and directories. .
With gLexec, the individual user's proxy submitted with their job is used to authorize the job and is reflected in the accounting. Without gLexec, the glidein pilot job's proxy is used and only that user account is reflected in the accounting. * y - downloads and uses gLexec. ress_host osg-ress-4.fnal.gov Identifies the ReSS server to be used to select entry points (CEs) to submit glidein pilot jobs to. The only validation performed is to verify if that server exists. entry_vos cms, dzero A comma delimited set of VOs used to select the entry points that glideins can be submitted to. These are the used as the initial criteria in querying ReSS for glidein entry points. entry_filters (int(GlueCEPolicyMaxCPUTime) <(25*60)) An additional entry point (CE) filter for insuring that specific resources are available. After the initial set of entry points have been selected using the entry_vos criteria, these filters are applied. The format is a python expression using Glue schema attributes. 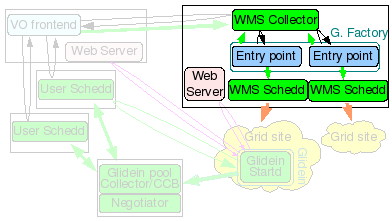 glideinwms_location /path/to/glideinWMS Directory of the GlideinWMS software. This software is used for both the installation and during the actual running of this glidein service. Important: This should be created before installing this service as the service's username and the web server user are generally different. This script will not be able to create this directory with proper ownership. web_url http://%(hostname)s:port Identifies the url used by the glidein pilots to download necessary software and to record monitoring data. In order to insure consistency, the installer will take the unix basename of the web_location and append it to the web_url value. So, for the value shown below in the web_location, the actual value used by the glidein pilots, will be web_url/factory/stage(monitor). Important: It may be a good idea to verify that the port specified is accessible from off-site as some sites restrict off-site access to some ports. This will contain a subset of values that will be in the final configuration file. Warning: Never change the files in an entry point by hand after it has been created! Use the reconfig tools described below instead. At this point, your Factory installation is complete and you can start the Factory. See below for the commands for running a Factory. Note: If you installed the Factory via RPM some files or commands will differ. Please refer to the OSG RMP Guide. The Glidein Factory comes with a init.d style startup script. See the monitoring section for more information and tools to monitor status. The first problem are signatures. Any change requires the change of the signature file, that in turn gets a new signature. Since the signature is one of the parameters of the startup script, all glideins already in the queue will fail. The second problem is caching. For performance reasons, most Web caches don't check too often if the original document has been changed; a glidein could thus get an old copy of a file and fail the signature check. There is only one file that is neither signed nor cached and can be thus modified; the blacklisting file called nodes.blacklist. This one can be used to temporarily blacklist malfunctioning nodes that would pass regular sanity checks (for example: memory corruption or I/O errors), while waiting for the Grid site admin to take action. Please, notice that if you make any errors in the new configuration file, the reconfig script will throw an error and do nothing. If you executed the reconfig command while the facotry was running, it will revert to the last config file and restart with those settings. As long as you use this tool, you should never corrupt the installation tree. NOTE: The reconfig tool does not kill the Factory in case of errors. It is also recommended that you only disable any entry points that will not be used. Never remove them from the config file. The glidein Factory supports the dynamic handling of downtimes at the Factory, entry, and security class level. Downtimes are useful when one or more Grid sites are known to have issues (can be anything from scheduled maintenance to a storage element corrupting user files). Caution: An admin can handle downtimes from Factory, entry, and security class levels. Please be aware that both will be used. This script can allow you to have more control over managing downtimes, by allowing you to make downtimes specific to security classes, and adding comments to the downtimes file. Please note that the date format is currently very specific. You need to specify dates in the format "YYYY-MM-DD-HH:MM:SS", such as "2011-11-28:23:01:00." In case of problems, you may want to test a glidein by hand. This will start a glidein on the local machine and pointing to the yourhost.your.domain collector. Please make sure you have a valid Grid environment set up, including a valid proxy, as the glidein needs it in order to work. You should see several condor_master and condor_procd processes. You should also be able to see one schedd process for each secondary schedd you specified in the install. You should see also a main Factory process as well as a process for each entry. The condor_q command queries any jobs by schedd in the WMS pool (-global is needed to show grid jobs). The condor_status will show all daemons and glidein classads in the condor pool. Eventually, there will be glidefactory classads for each entry, glideclient classads for each client and credential, and glidefactoryclient classads for each entry-client relationship. The glideclient and glidefactoryclient classads will not show up unless a Frontend is able to communicate with the WMS Collector.